Accommodation at Casa de Casal de Loivos. 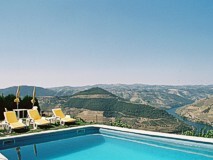 Casa Casal de Loivos is a beautiful manor house in the Douro valley looking down onto the Douro river. The house has belonged to the family since 1658 however, due to political instability in Portugal, the house was not lived in for over 30 years at the beginning of the last century. 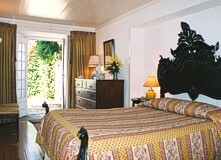 In 1991 the house was fully restored by present owner. 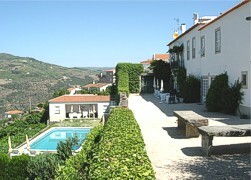 The house has featured in many travel documentaries on Portugal and was chosen by BBC television as having one of the six best views of the world. In the main house, there are 6 comfortably furnished double bedrooms..
All these rooms have doors opening onto the front terrace where, in summer, breakfast, lunches and dinners are served. In an adjacent cottage there is a double bedroom which as a direct river view and, unusually for northern Portugal, air conditioning. All the rooms have en-suite bathrooms. The swimming pool is set in the lawned gardens where you can enjoy pool side drinks or lunch served by the staff of the house. Evening meals in the Quinta can be served if requested in advance. The meals feature Portuguese cuisine using the traditional recipes of the country houses. Light snacks and drinks are available all day. The House is surrounded by is vineyards through which the guests may walk. In one of the buildings is a small craft shop stocked with local products. Here you can also buy the owners wine which has been produced under the label of the Quinta since 1999. The town of Pinhao is on the riverside below the Casa which is now the centre of the Port Wine production area. In Pinhao there are a number of local shops, cafes and restaurants. The railway station has famous pictures of local life on painted tiles. A trip up the river by train or by boat is recommended. The journey from Oporto airport to the house will take approximately 2 hours via Vila Real. A slightly longer alternative is to take the modern highway to Amarante followed by a pass over the hills past Mesao Frio and into the Douro valley and then along the road at the side of the river. I had a lovely stay. Everyone was very hospitable, the estate well kept, and the views are gorgeous! Casa Casal de Loivos Service perfect, good meals, fantastic view. It was hard for us and the other guests to find the right house. It shoud be better marked.